(CelebrityAccess) – PWR BTTM, the queer punk band consisting of Ben Hopkins and Liv Bruce released a new video for the title track from their forthcoming album, Ugly Cherries. "I’ve set my 'best self,' aka me in crazy monster drag, against my 'worst self,' aka me miserably staring at my cellphone alone in my apartment, in an attempt to take stock of my whole self." explains Hopkins. "All of the behaviors within the video are my own, and in staging them side by side I’m trying to take ownership of the good, bad, weird, and fabulous parts of my personality." 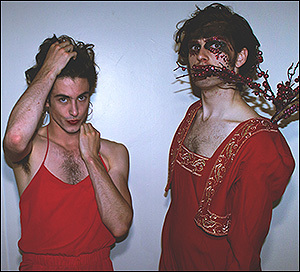 PWR BTTM formed at Bard College where Bruce and Hopkins bonded over a mutual interest in bringing elements of performance and drag artistry into DIY culture. While at Bard the duo recorded a demo, Cinderella Beauty Shop, and the Republican National Convention split EP with Jawbreaker Reunion. On these releases, Hopkins plays guitar and sings, and Bruce plays drums. Since then, the two have begun to share vocal/songwriting duties and have also started to trade off instruments. This development is very much apparent on their forthcoming LP, Ugly Cherries, an album documenting the duo's experiences with queerness, gender, and adulthood over the course of a year of living in upstate New York. Ugly Cherries was recorded by Christopher Daly at Salvation Recording Company in New Paltz, NY and mastered by Jamal Ruhe at West West Side Music. The full-length record is slated for a dual release on Miscreant Records and Father/Daughter Records on September 18, 2015.